The Queensland Government has announced a $500 million plan to build two new high rise style schools in Brisbane’s inner city which has seen some of the fastest growth in the state. The move comes after it was revealed West End State school has little area to expand and forecasts a need for over 700 new placements. Brisbane State High is also experiencing growing pains of around 20% compounding growth as opposed to the average 2% experienced in most other localities. Enrollments at Brisbane State High are currently sitting at 3144, well over its 3000 student capacity. The recent increase of inner city apartments has caused the added demand for inner-city placements with over 60% of school students at West End State school now living in apartments. The new schools would be the first inner city schools built since 1963 and would be built in partnership with Brisbane’s top universities. The government is was cautious to note that it isn’t only focused on the inner-city, stating that other new schools are underway in other growth areas across Queensland including Mt Low in Townsville, North Lakes/Mango Hill north of Brisbane, Calliope near Gladstone and Yarrabilba in South Logan. Ms Jones said the Palaszczuk Government was delivering a record investment to build new classrooms and schools throughout Queensland. “We have already built a new special school in Cairns and opened three new schools this year – Bellbird Park State Secondary College, Pumicestone State School and Fernbrooke State School,” she said. Deputy Premier, Jackie Trad said over the last 50 years, Brisbane used all available land to expand our existing school sites but you can only expand so much. “In the last decade we have seen more than 5000 extra students join state schools in and around the Brisbane CBD,” she said. “This growth is set to continue with more than 3,000 extra students expected to move into inner-Brisbane in the next five years. High rise schools are nothing new and recently have become more common in Australia. In Melbourne, the South Melbourne primary school is currently under construction which will have capacity for 500 students once completed. 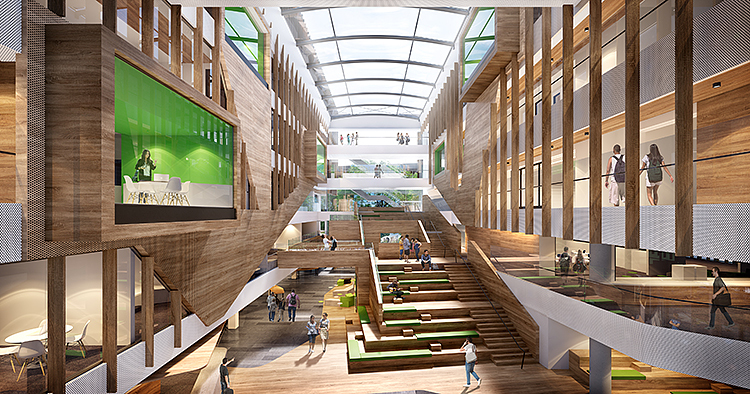 Construction is also underway for a $100 million six and seven storey science and technology based high school in Adelaide known as Adelaide Botanic High School. Once completed Adelaide Botanic High will cater for 1250 students and is similar in size and capacity to planned new Inner-Brisbane schools. The two new schools in Fortitude Valley and South Brisbane are anticipated to be completed by 2020. Very interesting concept and past time to address the community education needs in the increasingly densely populated inner city areas. The children’s educational development taken care of, what now of the physical and recreational development of students … sports grounds, etc.? You can have sports grounds on school roofs with no issue. In fact if you venture to South Brisbane and have a look at the school next to Lady Cilento Hospital, you can see the idea in real life.